There is a lot of talk about Alfred Hitchcock’s “creative decline.” Unfortunately, it wasn’t really a decline at all. It was a forced retreat. The director was still working under the tight reigns of Universal in 1969. The studio had set the director up in a cozy bungalow and had made him a very rich man. Unfortunately, they had also taken away his creative liberty and created an atmosphere that nurtured his creative decline (or what people perceive to be his creative decline). Their control of his creative ventures had driven his self confidence into exile. 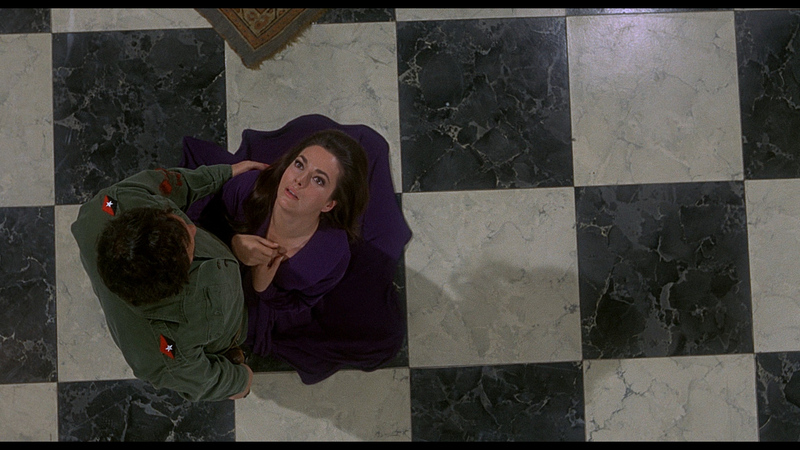 Kaleidoscope was to be shot on actual locations using natural light, a handheld camera, and unknown actors. The script was shocking and extremely controversial. Hitchcock usually allowed audiences to relate to a likeable protagonist, but this new project would focus on the exploits of an attractive but vulnerable serial killer. Unfortunately, the script’s explicit and unflinching violence disturbed the suits at Universal. In “Hitchcock Lost and Found,” Alain Kerzoncuf and Charles Barr summed up the situation in a single paragraph. Frankly, Hitchcock was at his best when he was allowed complete control over his projects. When one looks at his early years at British International Pictures (where he was reduced to making projects that were assigned to him) and compares them with his films made with Gaumont/Gainsborough (where he was allowed to choose his own projects, and have control over them), it becomes clear that Alfred Hitchcock worked best when he worked in absolute freedom. His years at Universal offer further proof of this when one compares them with his years at Paramount (where he was usually given creative control over his own output). In any case, it was felt that the avant-garde project didn’t have any commercial potential, and Hitchcock was convinced that he should abandon the project. If this had happened ten years earlier, he would have probably made the film with his own money (as he did with Psycho). Unfortunately, he agreed to drop the project for a more commercial venture… but what commercial venture? Universal was to blame for pushing an unwritten project into production in order to finish in time for a September release. Samuel Taylor agreed to re-write the script, but it was still being prepared when the film went into production. Filming certainly suffered from the rushed pre-production process, and the trouble would continue through post production. When test audiences hated the film’s original duel ending, Hitchcock shot an alternative ending that showed Jacques Granville boarding a plane to Moscow while André and Nicole Devereaux board a plane for Washington D.C. This ending raised a few eyebrows because Granville went unpunished, and it was felt that the French authorities would not accept this ending for a French release. To prepare for trouble with the French authorities, Hitchcock prepared a third ending utilizing already shot footage that suggests that Granville goes home and commits suicide. The debate about which of the latter two endings should be used continued until it was finally decided to use different endings for different markets. However, production records suggest that Alfred Hitchcock preferred the Airport ending that shows Granville leaving for Moscow. He claimed that it was more true to life, and he even suggested hiding the suicide ending away so that it wouldn’t be used. It is no wonder that Topaz is considered by many to be the director’s weakest American effort. The film was a box office failure, and failed to earn back its $4,000,000 budget. 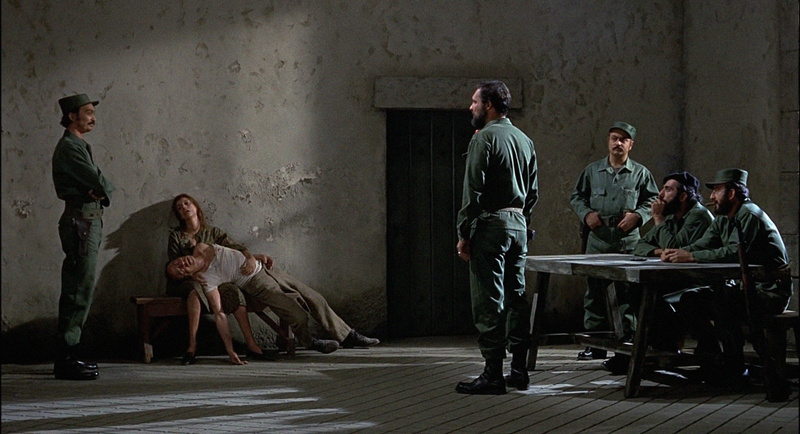 However, the film had some incredible moments that illustrate Alfred Hitchcock’s cinematic brilliance (such as Juanita de Cordoba’s exquisite murder, and the excellent Pietà influenced post torture interrogation that lead to Juanita’s murder), and there were a number of critics that enjoyed Topaz. The review that was published in The Independent Film Journal was particularly kind. “…The director is up to his old tricks, but they are still very good ones. An effective cast of mostly foreign players and a nicely complicated plot make the film thoroughly absorbing. Solid Box-office. There will undoubtedly be those movie buffs who will argue that Alfred Hitchcock’s Topaz is an echo chamber, [and] that everything in it has been done before by the master, and better. But after the malnutritious Marnie and Torn Curtain, it is a pleasure to find the director working with a densely plotted story-line. You have to keep on your toes during Topaz and that’s what makes it so enjoyable. The film is a thoroughly absorbing work, but an abrupt ending, meant probably to be ironic, has the effect of pulling the carpet out from under the viewer. 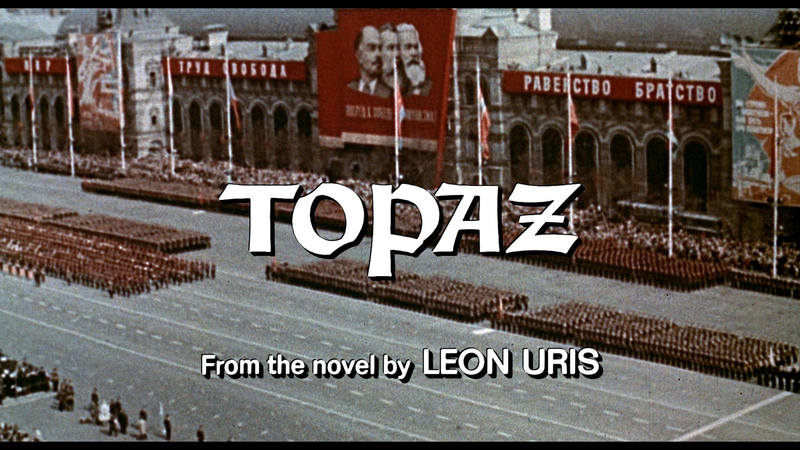 As a commercial entry, the box office potential for Topaz is very strong; the Hitchcock name alone would be a crowd-puller, but this time he is also working with a pre-sold property; the Leon Uris novel his film was based on was an international best seller. …Samuel Taylor’s screenplay has more than its share of cliché lines, but it also has its share of very amusing ones. It gets the characters on and off, and globe-trots efficiently enough, but two omissions are disturbing. We are never told just why Devereaux would risk everything for the American agent, and the arrival of Devereaux’s wife (Dany Robin) at the hide-out of Jacques Granville (Michel Piccoli), suspected of being a member of the Topaz ring is a surprise, but an unexplained one. In telling the complicated story, Hitchcock has supplied his usual touches. For a tortured woman’s inaudible whisper the camera rushes in to hear; Juanita’s murder is recorded by an overhead shot, and as her corpse collapses, the deep purple dress spreads out like blossoms of a flower; a seagull flying with an unusually large piece of bread in its beak giving away the fact there must be snooping picnickers nearby. Cameras glide up and down staircases, swoop onto mirrored reflections of the enemy’s face. Seeing things rather than hearing them, has always been a favorite device of Hitchcock’s (Rear Window was practically devoted to it) and in Topaz it is again used. Instructions between Devereaux and his contact take place behind a florist’s refrigerator glass door; an important transaction at the Hotel Teresa is shown from across the street; and in a spacious conference room, the camera way up amidst the chandeliers, we watch as various consuls shift into groups, isolating themselves from the suspected traitor. “It’s perfectly apparent from its opening sequence that no one except Alfred Hitchcock, the wise, round, supremely confident storyteller, is in charge of Topaz… Topaz, the code name for a Russian spy ring within the French Government, is the film adaptation of the Leon Uris novel, which itself was based on a real-life espionage scandal that kept both sides of the Atlantic busy in 1962. Topaz is not a conventional Hitchcock film. It’s rather too leisurely and the machinations of the plot rather too convoluted to be easily summed up in anything except a very loose sentence. Being pressed, I’d say that it’s about espionage as a kind of game, set in Washington, Havana and Paris at the time of the Cuban missile crisis, involving a number of dedicated people in acts of courage, sacrifice and death, after which the survivors find themselves pretty much where they started, except that they are older, tired and a little less capable of being happy. Topaz is, however, quite pure Hitchcock, a movie of beautifully composed sequences, full of surface tensions, ironies, absurdities (some hungry seagulls blow the cover of two Allied agents), as well as of odd references to things such as Michaelangelo’s “Pieta,” only it’s not a Mother holding her dead Son, but a middle-aged Cuban wife holding her dead husband, after they’ve been tortured in a Castro prison. …The people one remembers are those who are employed for the effect of their looks (John Vernon as a bearded Castro aide with brilliant blue eyes, Carlos Rivas as his bodyguard, a Cuban with remarkably red hair), or who are bequeathed vivid images by the narrative (Karin Dor as a beautiful anti-Castro Cuban who is shot for her efforts and collapses onto a marble floor, her body framed by the brilliant purple of her dress). The star of Topaz is Hitchcock, who, except for his brief, signature appearance, remains just off-screen, manipulating our emotions as well as our memories of so many other Hitchcock films, including Foreign Correspondent, Saboteur and Torn Curtain, all inferior to Topaz. This is a movie of superb sequences that lead from a magnificent Virginia mansion to the Hotel Theresa in Harlem, from an extraordinarily well-stocked Cuban hacienda to a small, claustrophobic, upstairs dining room in a Paris restaurant. Even architecture is important. It’s also a movie of classic Hitchcock effects. Exposition may be gotten across by being presented either as gossip or as incidental, post-coital small talk. Conversations are often seen — but not heard — through glass doors. A Cuban government minister, staying at the Theresa, finds a misplaced state document being used as a hamburger napkin. Even Variety published a review that wasn’t completely negative (though it did seem to fall somewhere between the two extremes). This praise is probably rather surprising to contemporary audiences and critics. Today, opinion tends to lean almost universally in the opposite direction. In fact, there were critics that were less than enthusiastic about Topaz upon the film’s release. As a matter of fact, John Russell Taylor (Alfred Hitchcock’s official biographer) wrote a review was especially negative. Richard Corliss wrote a review that was more of a diatribe against auteur theory than an essay about the merits and weaknesses of Topaz. The article had a number of digressions (which have been omitted here) that reveal a certain bias against Hitchcock and the popular opinion that he is an auteur. When he finally gets around to discussing Topaz, it isn’t surprising to discover that his words usually aren’t very kind. …Though Topaz is a leading man’s nightmare, it’s also a character actor’s dream. John Vernon, a powerful young Canadian actor (Point Blank, Justine, Tell Them Willie Boy Is Here), is outstanding as a manic Castro aide. 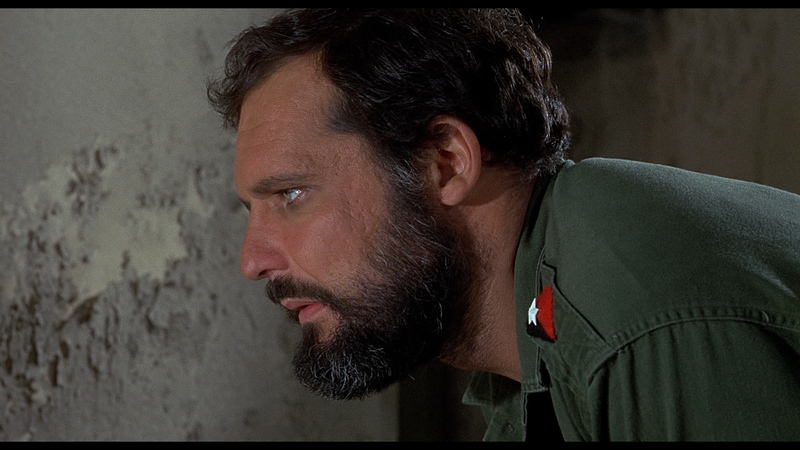 His black beard and marble-blue eyes first attract our attention, but Vernon keeps himself there by adding, to the Raf Vallone — “I am ze bool” hysteria of the role as written, an unusual amalgam of lust and tenderness for his mistress (who is really Stafford’s beloved, and a devoted anti-Communist), the heroic, warm, womanly Karin Dor. The scenes between Vernon and Dor are so superior to those with Stafford and Robin that you wonder how Hitchcock could have directed one feuding couple with extraordinary passion and tactile vividness, while letting a similar scene go memorably flat. The difference probably has as much to do with that felicitous congeries of situation and inspiration, of action and passion, of actor and character, as it does with any directorial epiphanies. Whatever the cause, these sequences in Dor’s villa are complex, human, and beautiful. They lead from Stafford’s idyll with his real love (who manages to spark this mannequin to real life), through Vernon’s discovery that Dor has betrayed him and her government — and it is a measure of Vernon’s and Hitchcock’s achievement that we can share the Castroite’s outrage and nearly tragic, cuckolded disillusionment — to her murder, photographed from above, her velvety violet dress filling the screen as she falls to the floor in a moving metaphor for the grace that informed her way of life and gives her final moral supremacy in their personal and political battle to the death. Throughout this whole middle section of the film, stereotypes become human beings, and Topaz comes vibrantly alive. The final third of the film, in which Stafford discovers two Russian spies working in the French government, lacks the power and passion of the preceding encounter. Vernon and Dor are physical actors; Michel Piccoli and Philippe Noiret, who play the spies, are more intellectual, Piccoli in his suave assurance, Noiret in his Lorrean paranoia. The “confrontation” is in fact so oblique that it never really takes place. There is a luncheon for six, of whom two are spies. Hitchcock works over our suspicions through the use of supercilious glances and portentous camera angles, but the villains (the two charmers, of course) aren’t revealed until later, and Stafford never gets to tell them off. The movie just runs out, like a tube of toothpaste. 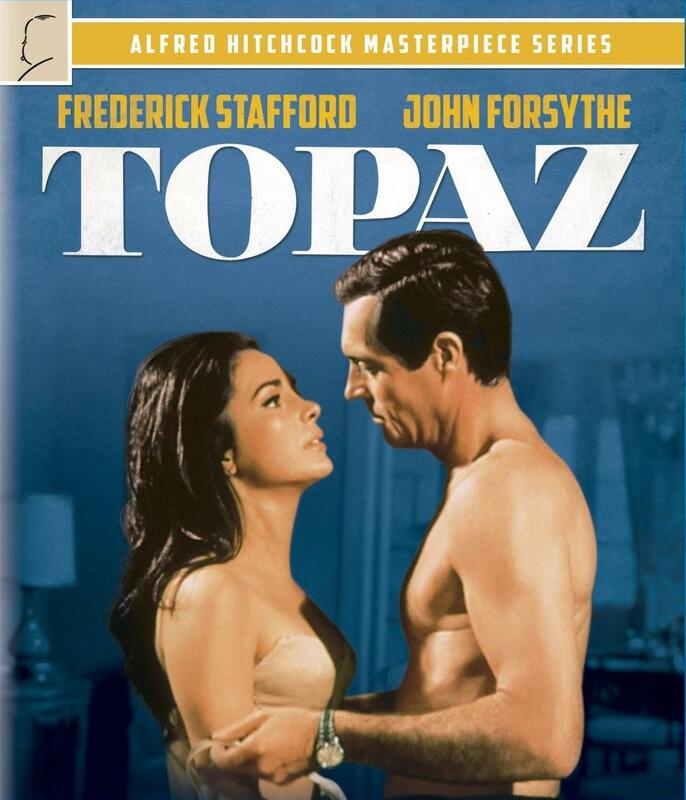 Topaz is one of this reviewer’s least favorite of Alfred Hitchcock’s American films, but it is a film that seems to improve with each viewing. There are sequences that are undeniably brilliant. It would be a mistake to disregard the film entirely. However, I maintain that it would have been preferable to have Kaleidoscope take this film’s place in Hitchcock’s filmography. Universal’s VC-1 transfer exhibits excellent color resolution and impressive clarity. The sharp detail showcase the various textures accurately, and the grain structure remains consistent throughout the length of the film. Of course, the transfer does have a few flaws that keep it from being one of the better transfers in Universal’s Hitchcock catalog. There is a fair amount of source noise at certain points throughout the picture, and there are a few instances when the color fluctuates. Luckily, the skin tones are almost always consistent and natural looking. As is usual with most of Universal’s color films, there is a fair amount of digital tampering performed on the image. There may be a few minor image halos at certain points in the film. Overall, the transfer is satisfactory. The two channel mono soundtrack is quite clean, and showcases clear dialogue without any distracting noise or anomalies to distract from one’s enjoyment. The film’s music and sound effects are also well rendered here. There is very little room for complaint here. Laurent Bouzereau again directs this “appreciation” of Topaz, but an objective “making of” documentary would have been preferable. While Leonard Maltin attempts to walk the viewer through a few of the film’s production problems, there isn’t enough information here to put it among Bouzereau’s other documentaries for Universal’s Hitchcock catalog (most of which are excellent). It is nice that an effort was made, even if it doesn’t completely satisfy. It manages to be just useful enough to maintain our interest, but it is disappointing to not have a more comprehensive look at the film’s creation. Why do we not include any information about Alfred Hitchcock’s preferred Kaleidoscope project? Where are the interviews with the actors and crew? Were they not willing to participate? John Forsythe appeared in The Trouble with Harry Isn’t Over. Why not question him about this film? These questions will have to go unanswered (just like our questions about Topaz). All three of the film’s endings are included here (“The Duel,” “The Suicide,” and “The Airport”) “The Duel” isn’t complete, and seems to be in poor condition. This is probably because it was never a part of any official release due to the negative comments at preview screenings. The other two endings were both released in various markets, and appear to be in fine condition. It is interesting to compare these three endings. This theatrical trailer is an interesting artifact. It features Alfred Hitchcock, but lacks the level of wit that one sees in some of his other trailers. It is certainly good to see it included here. “The Mendozas” sequence storyboards are shown with video footage of the film so that fans can make comparisons. This should interest fans of storyboarding. 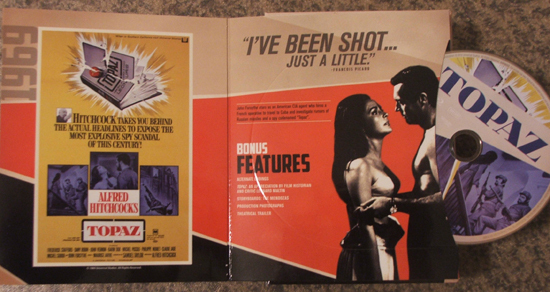 This is a slideshow of movie posters, vintage ads, and production photos. It is nice to see that this carried over from the earlier DVD editions. 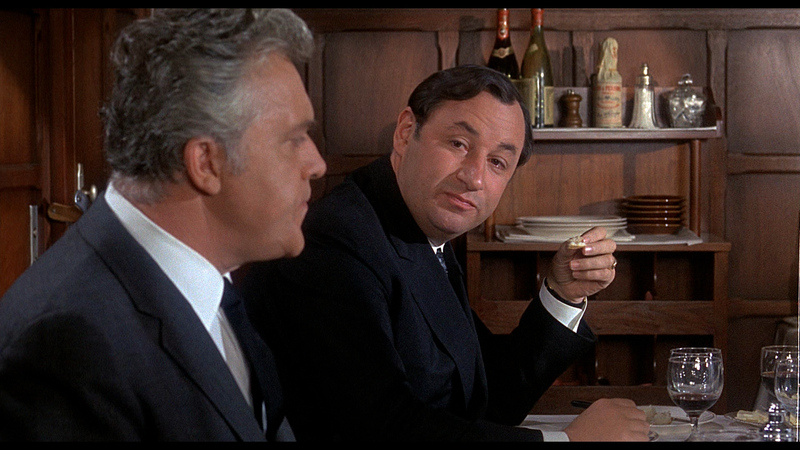 Topaz isn’t one of Alfred Hitchcock’s better American films, but it is has moments of brilliance. Since the film seems to improve substantially with each viewing, fans will probably want to add it to their collection. Luckily, Universal’s Blu-ray transfer is a decent upgrade to the previous DVD editions of the film. Reblogged this on pundit from another planet. Devon, what a thorough, interesting review. I enjoyed the section regarding studio suffocation and freedom. 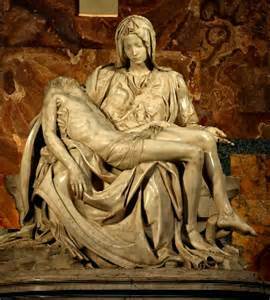 I think about him achieving this grand reputation and the need to protect that by creating art. Then all the players want to interfere. There’s something to be said about pre-star freedom before the money bags try to control you. Nice post. So thorough, and really fascinating. If you enjoyed this article, you might also find the article on “Torn Curtain” interesting. Great review, as always! 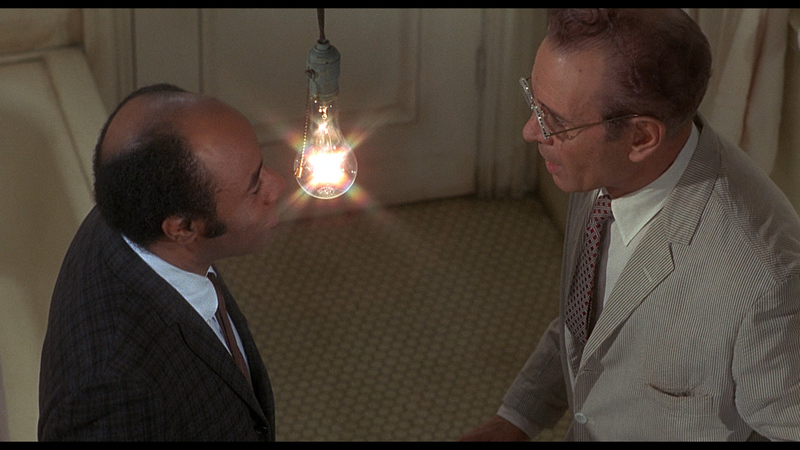 I’ve always suspected that Hitchcock really enjoyed shooting the Harlem sequence with Roscoe Lee Brown, because that section has a spark that is lacking in the rest of the film.